The #MeToo movement inspired women around the world to speak up about issues of gender equality and female equality. Now the tourism industry is focusing on empowerment, with new tours and programs designed specifically for women travelers. On March 8 — International Women’s Day 2018 — Exodus Travels, a London-based adventure tourism operator, launched a series of all-female departures to locations as diverse as Iran, Myanmar and the French Riviera. The guided tours, which range from eight days to just over two weeks, cost an average of $2,500 and will pair groups of 4 to 16 women with local female guides on high-adrenaline itineraries. Intrepid Travel, an adventure travel operator focused on small-group itineraries, also chose International Women’s Day this year to respond to the #MeToo movement with its own line of female-only tours. The operator is launching three specialized itineraries for women only — to Morocco, Iran and Jordan — which promise to deliver a “sense of sisterhood” to travelers while they explore sites like the foothills of Azourki, Persepolis and the Dead Sea. Intrepid and Exodus are far from the first operators to offer gender-specific itineraries. AdventureWomen, a tour company catering specifically to women and entirely female-operated, has been around since 1982. WHOA — it stands for “Women High on Adventure” — opened its doors in 2013. But interest in men-free trips has spiked, with Exodus reporting a 300 percent increase in women on their tours over the past few years, and a jump from 55 percent women to 65 percent in the past 12 months alone. Intrepid saw the number of women booking trips through their company surge by 35 percent in just the first half of 2017. Also on International Women’s Day this year, the longtime operator Trafalgar Tours introduced #SheGoes, a monthlong campaign meant to empower women through travel, inspired by the #MeToo movement and launched in partnership with “1,000 Places to See Before You Die” author, Patricia Schultz. 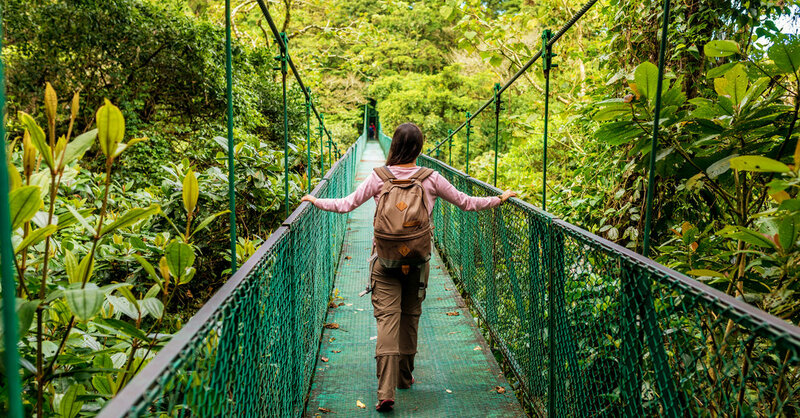 The campaign highlights five Trafalgar itineraries that the company believes will build women’s confidence and inspire them to push their own limits, including India (“She Goes to Reflect”); national parks in the United States (“She Goes to Test Her Limits”) and the Costa Rican jungle (“She Goes to Escape”). While men are welcome to join women on these tours, each was designed specifically for women adventurers, and Trafalgar is offering a five percent discount (to both men and women) if they are booked before April 28 — within one month of International Women’s Day. An additional $50 voucher and a signed copy of Ms. Schultz’s book are also available to those who mention the #SheGoes campaign while booking. Other brands are realizing that campaigns launched ahead of the #MeToo movement now have renewed momentum. The W Hotels brand, which created “What She Said,” its platform for the discussion of gender equality in 2016, harnessed the energy of the #MeToo movement to launch an expanded campaign in 2018, starting with a Feb. 23 program at the W Hollywood featuring the writer and director Ava DuVernay. The most surprising offshoot of What She Said, said Mr. Ingham, was its embrace by properties in the Middle East — female empowerment is still a topic rarely spoken about in public. The W Dubai celebrated International Women’s Day on March 7 with a What She Said event focused on fitness and wellness, moderated by Ritu Upadhyay, the Middle East correspondent for Women’s Wear Daily, with a panel that included Raha Moharrak, the youngest Arab woman to conquer Mount Everest, and Engy El Shazly, an Egyptian ballerina who was the first in her country to dance on stage while wearing the hijab. The W Doha, the W Dubai and also the coming W Amman will all host their own What She Said events later this year.